Learn how to reset your password if you forget it. 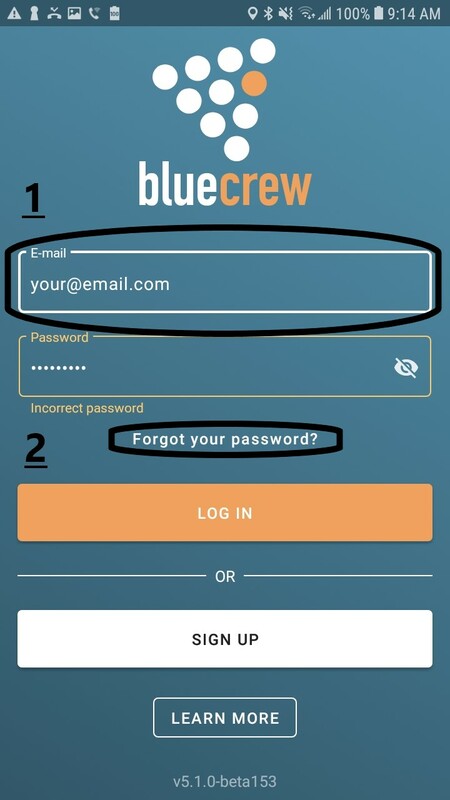 If you have forgotten your BlueCrew password there are several ways to reset it. For IOS (Apple products): When you go to sign in on your computer, tablet or phone, there's a button that reads "Forgot your Password?" at the bottom. First you will have to enter your email address in order to click forgot password. Press this button (Forgot password), and you will be receive an email that will allow you to reset your password. Make sure the email you enter is the same email you used to sign up with. For Android: Start by entering the email, then enter the password you may think it is, if unsuccessful then the 'Forgot Password' option will then pop up below. Press it. Below is the number of steps it takes to reset your password. It will ONLY work with the email you used to sign up. If you try resetting your password through the app and you aren't successful, be sure to try accessing our website, bluecrewjobs.com, on your phone or a computer and you will be able to reset from there. If you have multiple email addresses, remember that this could possibly be the problem as well. Be sure that you are using the email address that you signed up with before you attempt resetting your password.